Order the book from Amazon or your favorite book store. 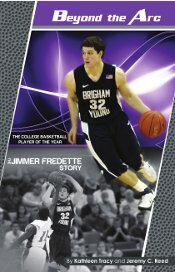 Considered by many as the greatest BYU hoops player in the university's history and destined to be a legend as one of the NCAA's all time great basketball stars, Jimmer Fredette began his rise as a short, stocky ball boy who suprised his critics with his wicked crossover dribble and deadeye shot. This book for youth readers, ages 9 to 15 (but interesting to other ages too), follows Jimmer's rise as a select and high school basketball star from Glens Falls, New York, the college player of the year while at Brigham Young University, and then to reaching his goal of playing in the NBA, for the Sacramento Kings. Jimmer's personal journey from small town boy to national role model is an inspiring story of how family, faith, and fortitude can lead to the top of the game. Kathleen Tracy is an experienced and prolific author with over 90 books to her credit (including around 45 young adult titles). She has written biographies about notables such as Jackie Chan, Don Imus, Morgan Freeman, Jerry Seinfeld, Ellen Degeneres, Beyoncé, Jennifer Lopez, Elvis Presley, Justin Bieber, and many others. Her athlete books about Troy Polamalu and Eli Manning are written for young readers. Jeremy C. Reed is an hoops junkie who has played pickup ball nearly every week for the past 25 years. He's coached over 12 youth community teams, AAU/BCI select basketball, at some college camps, and was an assistant mens coach in the Scenic West Conference (back when Coach Rose was at Dixie). In the late 1990's, he published several newsletters and a print magazine covering girls high school basketball recruiting. Reed has authored and edited various technical computer administration guides and Beginning Boy Scouts. He has eight children. "The beginning was pretty good. Maybe this is just a BYU guy — I don't really care. I had never heard of him before now. It got me into it more when you compared him [as a pop sensation], wunderkind and when you brought in the quote from the tweet. THEN....it seemed interesting. ;) I was hooked! Great writing." "I enjoyed reading it through." "Thanks for the opportunity to get to read the book. I enjoyed the read." "The book is great. We plan on donating a copy to our kids' school library."